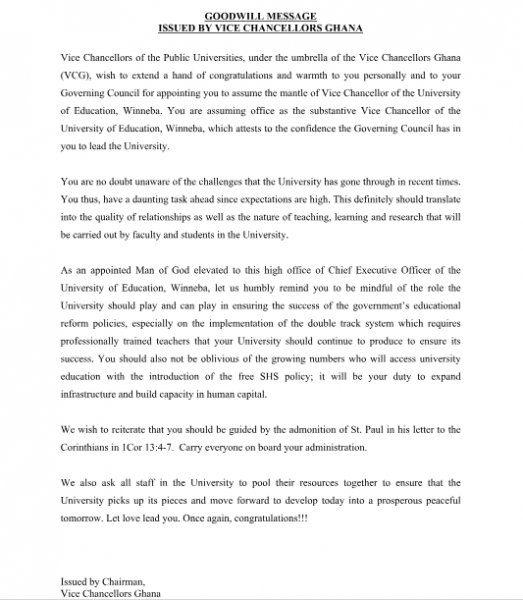 Following his appointment as Vice Chancellor of the University of Education, Winneba, Reverend Father Professor A. Afful-Broni, PhD has received a goodwill message from the Vice Chancellors of Public Universities congratulating him for his appointment. “You are no doubt unaware of the challenges that the University has gone through in recent times. You thus, have a daunting task ahead since expectations are high. This definitely should translate into the quality of relationships as well as the nature of teaching, learning and research that will be carried out by faculty and students in the University”, part of the letter read. BA: Atronie; Youth Boycott Public Hearing For….